. 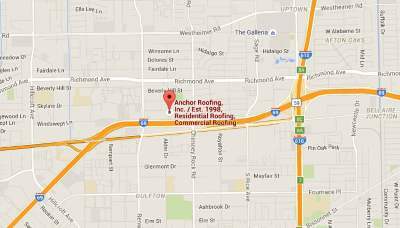 Insurance Re Roofing Information | Roofers in Houston Texas | Anchor Roofing Inc. If you have fallen victim to an act of God – Mother Nature, and your roof as well as home or business in general is damaged. Beware of, “The Doorknocker”, this is a person whom shows up at your door after a weather event. Typically they will start with something like, “Sorry to bother you, I was just in the area taking care of some of your neighbors and I noticed you had damage”. Then they go on about how they are insurance specialist and can get your insurance company to pay for your damages and that they would be willing to conduct a free inspection so they can check for damages, etcetera. In the world of contracting there are basically two types of contractors. The “Doorknocker – or Insurance Specialist”, who typically specializes in working for your entire insurance proceeds and want you to sign a contingency, or sometimes they may refer to it as, “consent to negotiate with your insurer”. Then there is the established contractor whom you typically find on your own. Or is recommended to you by a trusted friend or family member, still if it is a referral and you are not familiar with the contractor proceed with caution. It is recommended by the Better Business Bureau never to sign a “Contingency” or any type of agreement to work with a person whom knocks on your door and that you don’t personally know. There are many associated downsides to signing a “Contingency”, as it is basically a contract with binding terms and should you decide to go another route often there is a penal sum associated with the “Contingency”, and not allowing the company whose representative got you to sign it to complete your roof or contracting once you have signed if it becomes an insurance claim. The other type of contractor is typically referred to as, “A cost plus contractor”, whose business model is set up around cost of materials, labor, and overhead and profit. A good cost plus contractor should not require you to sign a “Contingency”, and will represent your best interest in good faith of earning your business. I can’t count how many times I’ve picked up a client who had signed a “Contingency”, and had to pay the company they signed the contingency with to go away. I remember one instance after a storm where a proceeds contractor that came to Houston from Florida used a high pressure close to get a business owner to sign a, “Contingency”, and the business owner’s attorney was a Commercial Real Estate Attorney whom we had a good relationship with. He called me up and asked me to look at the roof on this particular property, and to evaluate it in regards to the adjusted insurance claim. When I saw the roof first I knew there was only one roof present, when I saw the Insurance proceeds it listed multiple roofs to be removed and replaced which greatly drove up the cost of the new roof / re-roof. In the end the insurance proceeds contractor was paid $27,000.00 to go away and we put a new roof on the building and the owner still came out way ahead, versus the other way where the proceeds contractor would have taken all the proceeds and left the owner to cover the entire deductible for their insurance. I have explained how this works to many people, attorneys, and property management companies how easy it is to play by the rules, and come out ahead. Here in Texas the entire State is considered a Right to Work State, in being such anyone can be a Roofer, or General Contractor. The easiest way to do this is to go to http://www.irs.gov and in minutes any company, group, or person, can have a EIN (electronic identification number) assigned to the new company they may wish to form. For example say, John Smith owns a property, he can go to the www.irs.gov site and get a EIN for John Smith Construction Group for free, he then can take the EIN to a court house and for $18.00 get a DBA for John Smith Construction Group, now John Smith is in complete control of his claim and the proceeds, and can put his project out to bid to reputable established contractors and go with whichever one he feels most comfortable with. If John Smith’s Construction Group can get the work that is listed in his insurance claim completed for less than the amount the claim pays, then John Smith’s Construction Group is legally entitled to the difference; however the difference is taxable income and you must claim it when filing your taxes. It is illegal for a proceeds contractor, or any contractor to say or offer to pay your insurance deductible or part of it; however when you take the steps above you can help yourself, be in complete control, and possibly make a profit legally. I’ve walked many people and companies through this process, and even how to get supplements, as well as prepare invoices when it is time to close out your claim. If you have fallen victim to a weather event Anchor Roofing will gladly help you with this process and do so without a Contingency in good faith that hopefully we will earn your business. If you are interested in learning more about how this works and if it is a good fit for you, or your business please call us or fill out our request a quote form. Thanks for your time and consideration. Contact us for roof repair Houston for reconstruction and any leakage in your roof.